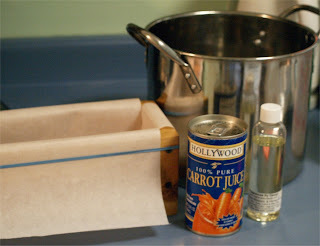 I fell in love with a bar of carrot soap a few years back when I was in a soap swap. The bar was simply wonderful and since that day I have wanted to create a bar of my own. I went to the store Friday night for a few items and noticed that carrot juice was on sale. Humm.. no time like the present to give it a whirl. I brought out all of my soaping goodies yesterday (Mother’s Day) and began my fun. This bar is made with rice bran oil (rbo); I had some so I thought I would try to finally use it all up. I scented the batch with Nectarine Blossom & Honey Jo Malone type from Fragrances by Design. This fragrance oil was purchased because of wonderful reviews and I wanted to try something new. What a beautiful fragrance and it fits the bar quite well. Everything went so smoothly together, oh happy day! I checked (I know, a big no, no) last before I went to bed and it was still in gel stage. Hummm.. I went to bed with my fingers, toes, and knucles crossed. Once the hub and bub of the morning was behind me I went and opened up the lid to the soap. I have a huge crack in the top. Arrrgh! I cut the loaf up and now they bars will be curing for six weeks. I’ll take a picture of them in a few weeks and let you know how they are doing. The do smell wonderful and you really can’t see the crack too much. 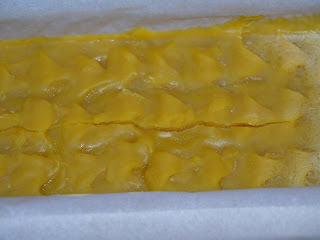 *Every time I make soap with rbo, I have issues, so I think I will not attempt any more bars using it. Just stick with my recipe and know what to expect for the end results.